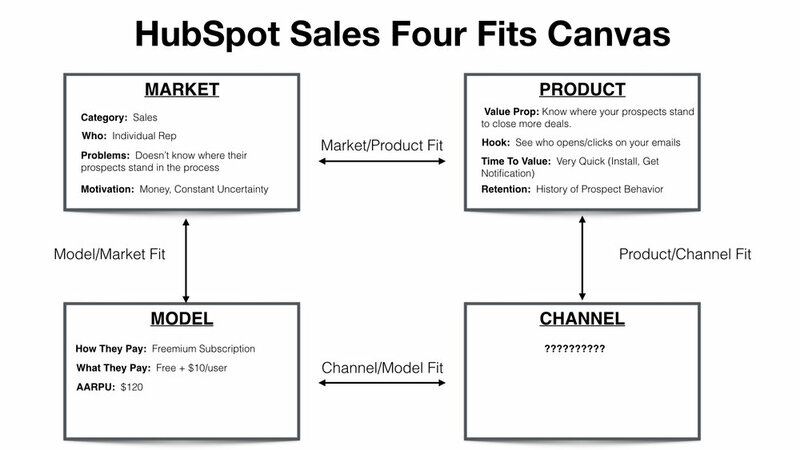 This post is the HubSpot Sales case study that illustrates the concepts of the 4-Fits Framework, a 5 post series in which I explain the four frameworks you need to align to grow to a $100M+ company. Subscribe to receive the rest of the series. When I joined HubSpot in January 2014 the mission was clear. One, help build the foundation for a new $100M line of business. Two, do it with a freemium and touchless model. The journey was one with many twists, turns, and lessons which I've boiled down into the Four Fits Framework that I went through in the past five posts. In this post, I will walk you through how we laid the foundation for the HubSpot Sales product and set it on course towards that $100M goal. Disclaimer: I left the company over a year ago and have no knowledge of current numbers. Nothing in this post should be interpreted as revenue figures or the official opinion of HubSpot. This post is an overview of the first two years (2014 - 2016) of the product where I was involved. Please see HubSpot's public quarterly announcements for any numbers or official statements. In the introduction, I explained there are two types of companies: Tugboats, where growth feels like you have to put a ton of fuel in to get only a little speed out. Smooth sailors, where growth feels like the wind is at your back. The difference between these two are not the common mantras of build a great product, product market fit is the only thing that matters, or growth hacking. In part two, I talked about why we should think about Product Market Fit as Market Product Fit, how to lay out your Market and Product hypotheses, and how understanding whether you have Market Product Fit comes down to Qualitative, Quantitative, and Intuitive indicators. In part three, I covered Product Channel Fit - the concept that products are built to fit channels, channels are not built to fit products. In part four, I covered Channel Model Fit, which explains how channels are determined by your model. 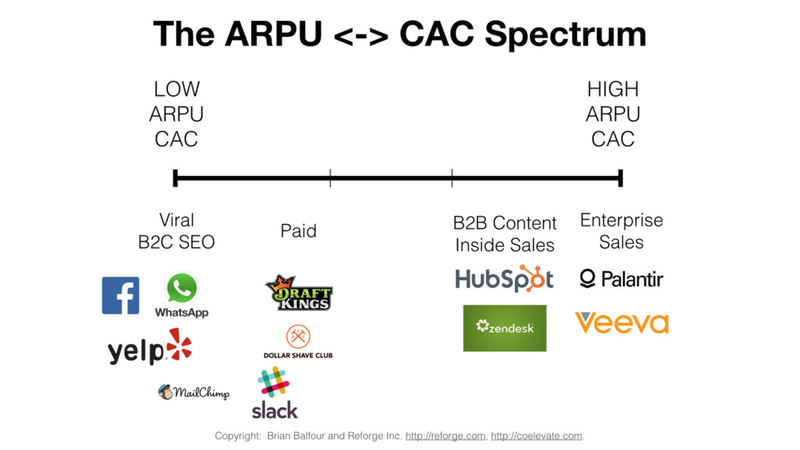 I went through the ARPU ↔ CAC spectrum and how your product and product tiers need to align on this spectrum. In part five, I covered Model Market Fit - how your model influences the target market and vice versa. The road to $100M doesn't start with product. Which is why the term Product Market Fit never sat right with me. Starting with product puts the cart before the horse. You are starting with the solution, and then trying to fit it to the problem. We need to do the reverse. Start with the market, then look at the product. The problem your company exists to solve lies within your market and target audience, not within your product. Christopher O'Donnell, Dan Wolchonok, and a few other engineers did this initial work and built the very first version of HubSpot Sales (then known as Signals). The total team size was about 7 people and the product had about 2,000 WAU, and maybe a few thousand in MRR. Category. What category of products does the customer put you in? Who. Who is the target audience within the category? There are always multiple personas within a single category, so this breaks it down further. Problems. What problems does your target audience have related to the category? Motivations. What are the motivations behind those problems? Why are those problems important to your target audience? Who. The individual contributor. There were also two sub-types of ICs: SDRs and Account Reps. Problem. Not knowing where a prospect or client stood in the process. Motivation. A couple of motivations: 1) Money. Knowing where a prospect was led to better prioritization and selling, which led to more closing. 2) Uncertainty. The target audience's life was filled with constant uncertainty. Relieving that uncertainty was a big deal. Core Value Prop. What was the core value prop of the product? How did it tie to the core problem? Hook. How could the core value prop be expressed in the simplest terms? Time To Value. How quickly could we get the target audience to experience value. Stickiness. How and why will customers stick around? What are the natural retention mechanisms of the product? The v1 of the product was extremely simple. It consisted of a Chrome extension that, with a click of a checkbox, let you track your emails and get instant notifications on who opened and clicked on your emails. You got up to a couple hundred notifications for free, or paid $10 for unlimited notifications. But just because we had hypotheses, doesn't prove that we had Market Product fit. The best indication for Market Product Fit are retention curves that flatten. This indicates that users are receiving real value over a period of time. Luckily as we broke down the cohorts, HubSpot Sales retention curves looked similar to the blue line. There was great indication of market product fit. Learn More Growth, One Email Per Post. We had solid hypotheses for 3 of the 4 elements, but we were missing hypotheses around our channels. 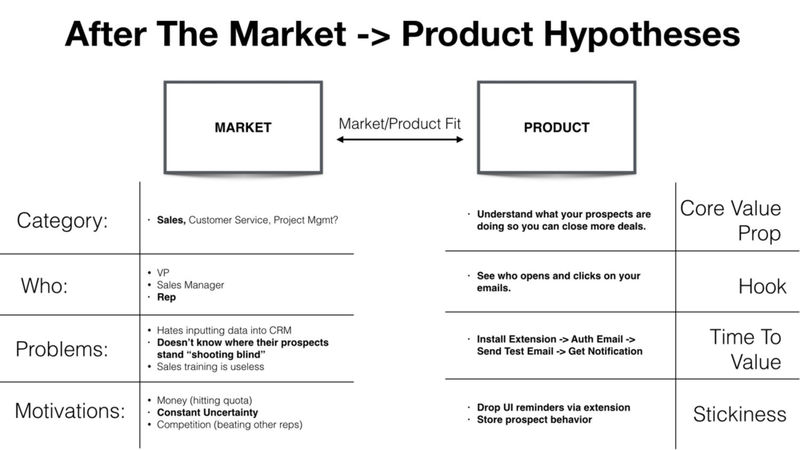 In the early days of every product, most of your time is spent on proving your Market Product Fit hypotheses. But that doesn't mean you can ignore the others. You need to have hypotheses for all the elements. The fits work together and influence each other. If you treat them in isolation, you will end up trying to fit a square peg in a round hole. Which brings us to phase two, defining and proving our Channels. So where did HubSpot Sales exist on this spectrum? Did our channel hypotheses fit? They did indeed. Virality fit with our free tier (no ARPU, low friction). Paid Marketing fit with our $10/user tier which had higher friction but higher ARPU to support the channel. Once we laid out these hypotheses we spent the next few months proving them out, and thankfully we were correct. A solid incentivized viral loop, along with Facebook Ads, made up 70% of our growth. We went from 2K WAU to 100K WAU and meaningful MRR very quickly. The equation answers the question - at your current annual average revenue per user or customer does your target market have enough customers in it to get feasibly get to a $100M+per year business? The issue was that there are only 2-3 million salespeople in the target market if you take out brick and mortar retail salespeople and outside salespeople, who weren't a good fit for our product. At our $120 ARPU we would have needed 1 million paying customers (or 33% - 50% of the target market), which also meant we needed to acquire 10 million+ free users, given our conversion rates. Those numbers didn't feel reasonable for our current definition of the market. Most low ARPU freemium businesses (Dropbox, Evernote, etc) address much larger markets. Interestingly, around this time we revisited our personas by interviewing a lot of customers. And we happened to find totally new segments of users using and paying for the product - small business owners, recruiters, marketers, and more. We called the group collectively, Relationship Focused Professionals. These were professionals who were communicating externally a large portion of their day. We redefined our Market hypotheses and checked to see if everything else still fit (it did). This new market definition was much bigger and the Model Market fit equation made a lot more sense. About a year in growth was cranking. We had hundreds of thousands of WAU's and MRR was following. We had found the four fits among our initial target audiences and were looking to layer on more growth. The $25/user/month price point created too much friction to effectively drive with the lower CAC channels of virality and paid that were working on the free and $10 tier. So we tried implementing content and inside sales to drive sales of the $25 tier. Content and inbound sales was the bread and butter of HubSpot's history. But in a company full of experts around the channels, it just didn't work. The ARPU of the $25/user tier just didn't support the higher CAC channels of content and inbound sales. In addition, it just wasn't driving the volume needed to build a big business at that price point. As a result, we eliminated the $25 tier and created a $50 per user per month tier, adding an additional feature or two to the product. With the hard work of Mike Pici, and others, the machine started to click and the economics started to work out. About 18 months in after a number of twists and turns we had the four fits. We had grown from a few thousand WAU's, to hundreds of thousands and a couple thousand in MRR to a few hundred thousand in MRR. Great, right? Well our biggest shift was still ahead. I remember sitting in one of our monthly management meetings, reviewing the numbers and progress of the business and someone made the observation - “these customers look really different from the core HubSpot customer.” The statement lingered in the air with a lot of weight. HubSpot Marketing had a completely different market, model, and model market fit. HubSpot Marketing targeted mid market customers and therefore had a model with an ARPU of $8K - $10K. They lived in a completely different place on Model Market fit. Our mission for HubSpot Sales had been to build a $100M line of product with a freemium model. To do that, we had a lower ARPU and to achieve model market fit needed to target a broader audience, which included a lot of small businesses and business owners. A few years before my time, HubSpot had taken a big bet to focus on the mid market. It was a big hard bet that after a lot of work paid off for the company. The idea of veering away from that again caused a lot of pain. The suggestion was raised that we take what we had, and just start focusing on targeting the mid market. The problem was that would have broken HubSpot Sales' Model Market Fit, and would have taken us off track in building a $100M line of business. 1. Choose The Model - Decide we wanted to keep the freemium, low friction, touchless, and low arpu model, and embrace a different type of market veering away from the core mid market customer that HubSpot had seen so much success with. This also meant we needed to stay on a path where we were building a product for that broad audience and double down on virality and paid acquisition to keep the fits aligned and continue to grow. 2. Choose The Market - Decide we wanted to focus on the mid market customer. As a result, change everything else including the product, the channels, and the model in order for the four fits to align. (Remember, if you change one element you need to change all the others to fit). Product - We cut the $10 tier and moved those features to the $50 tier. In addition we doubled down on additional features within the $50 tier targeted at the problems of our new market definition. Channels - We massively reduced efforts on virality and paid, and doubled down on content marketing and sales to align Product/Channel Fit. Model - We doubled down on the $50 tier selling minimum seat, annual deals, which increased the ARPU to align Channel Model Fit and Model Market Fit. The changes were painful. We had spent 18 months going after a different strategy and learning a ton about new channels and models. But ultimately changing course was the right decision. Making the shift unlocked the next major phase of growth, leveraged the DNA core to rest of the business, and aligned better to the overall mission of the company. 1. You need all four fits to align to be able to grow into a $100M+ company in a venture backed timeframe. Getting all four fits to align is incredibly difficult, which is why these types of wins are so rare. If you don't have all four fits, you may still have a successful company, but either it will grow slower than the venture timeframe or it will have a lower ceiling. 2. When you change one component within the framework, you need to revisit and change the rest, just as we did with the model vs market choice. One of the biggest mistakes is thinking you can just change one element and all will be fine. It is part of the reason why moving up and down market is so difficult. 3. The fits are always changing and evolving. A market can shift, a new channel can emerge, your channel can shut down, and so many other things. In the earliest days of your startup, I recommend revisiting this framework monthly as the pace of change is quicker. As things grow, revisit it every 3 months, and then later revisit every 6 months. 4. If you are building a new line of business inside a larger company, like we were at HubSpot, you should avoid pursuing a path where all the components of the framework are different than those of the existing core business. If all of them are different, and there is no institutional knowledge, distribution, or other components to leverage, then that new business should realistically live as a different company, not a line of business within the larger company. If you want to go deeper on learning and implementing these frameworks and many others, consider joining the Reforge community.